﻿ Produce 3.0mm(1.54')5X7 Dot Matrix Display , Export 3.0mm(1.54')5X7 Dot Matrix LED Display, Supply 3.0mm(1.54')5X7 Dot Matrix Display suppliers, OEM 3.0mm(1.54')5X7 Dot Matrix LED Display. ◇ 1.54inch (39.10mm) Matrix height. ◇ Flat package and light weight. ◇ High quality and low cost. ◇ High reliable and intensity. configured in a 64 dots 8*8matrix array. 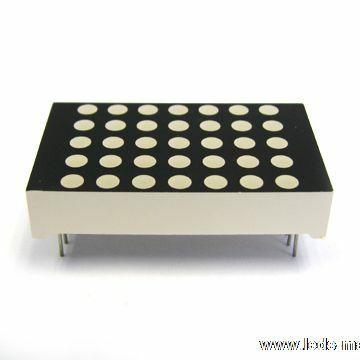 ◇ These devices are made with white dots and black surface.